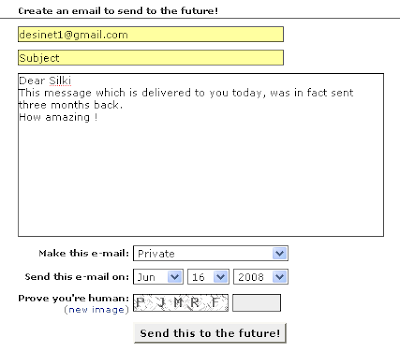 A new, (although not so new) website, FutureMe enables you to send an e-mail to yourself (or others, if you prefer so) so as to get it delivered any time in future anyday between 90 days in future to 50 years, yes fifty years. (Although I really don't know with the rapid changes in info-world, how far it is appropriate to talk of fifty years). Most of the people have been using it for fun and for setting up goal reminders, Even you can use it as greetings if you tend to forget importnt birthdays and anniversaries. They also have a e-mail management system, which takes care of changed e-mails in case you are worried about your changing e-mails in future.